AAA is projecting that 50.9 million Americans will travel 50 miles or more for the Thanksgiving holiday, marking the highest level in a dozen years. That would be a 3% increase over last year and the highest travel volume since 2005, with 1.6 million more people taking to the roads, air, rails, and waterways compared with last year. AAA and Inrix, a global transportation analytics company, predict travel times in the most congested cities in the U.S. during the holiday week could be as much as three times longer than the optimal trip. Air travel is projected to grow the most this year, by 5%, with as many as 3.95 million travelers taking a plane to their destination. This has been boosted by some of the cheapest prices for airfare since 2013, according to AAA. Gas prices have also gone up this year, with travelers paying some of the highest gas prices since 2014. Despite the increase in gas prices, the vast majority of holiday travelers will use the highway, and automobile travel is expected to grow by 3.2% this year. With 45.5 million Americans hitting the roads, delays of up to two and three times the normal commute are likely in large cities. Of the ten most congested cities, Chicago is projected to see the most severe slowdown with a delay of three times the normal amount, followed closely by San Francisco and Los Angeles at 2.5 times the normal commute. 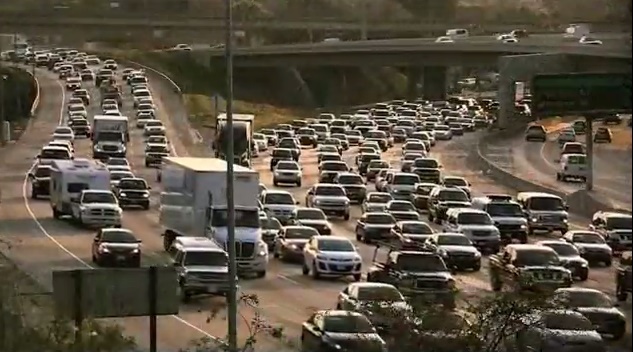 If sitting in traffic for hours wasn't bad enough, AAA says that hundreds of thousands of drivers will likely have an even worse day. AAA expects more than 330,000 motorists to be stranded by lockouts, flat tires, and battery-related issues over the Thanksgiving break. With so many people traveling for Thanksgiving, just where are they headed? For warmer weather and theme parks, apparently. Anaheim, Calif. and Orlando, Fla. are the top two destinations over Thanksgiving – maybe not coincidentally the locations of Disney Land and Disney World, respectively. New York City, Honolulu, Cancun, and Las Vegas were also in the top 10 destinations.